You won’t pass or fail. You’ll just get some direction. In previous blogs, I offered tips on how to earn specific Micro Certifications, and how to determine which Micro Certifications were best for your career goals. And while making career decisions is a serious matter, I thought of a fun way I could go about offering more help. I’m sad to admit that my inspiration to create this quiz came from Buzzfeed, but after learning I would be in House Stark (Game of Thrones reference) by selecting my favorite foods, I decided Cybrarians needed a light-hearted way to get them on the right track when it came to certifications. 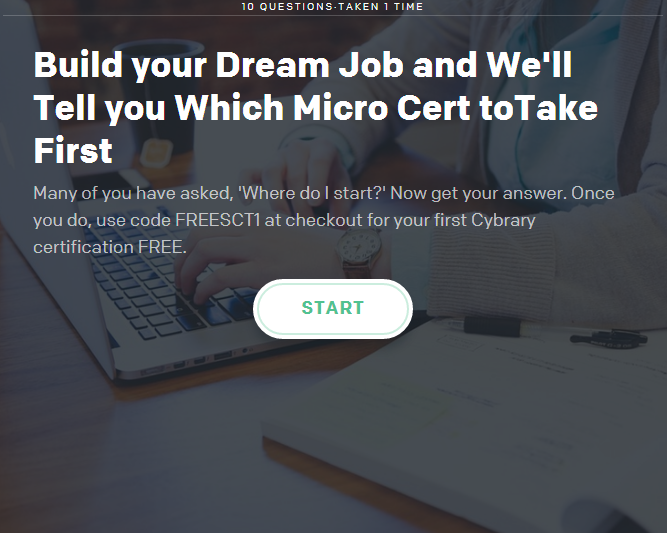 Micro certifications prove your working knowledge of a group of skills that form core principles of the most common jobs in the cyber security industry. This quiz is intended for beginners, or anyone looking for some light entertainment. It offers guidance, yes, but is not meant to inspire life-altering decisions, nor is it meant to offend anyone in a role other than the quiz results suggest. Let’s have fun with this! And remember, your first certification is FREE with code FREESCT1 at checkout. For certification veterans, you can now get an unlimited micro certification subscription here.